The base board size is 2.8m X 700mm or about 10’ X 2’4” in old money. 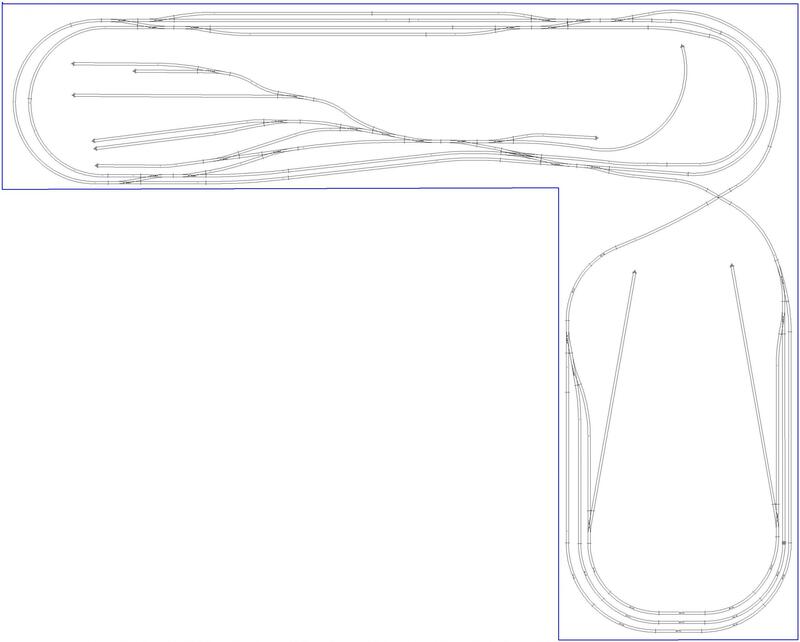 I have laid the track and points for the main loops and the top long sidings and the siding on the far right which was to go to a cassette fiddle yard. None of the track inside the loops has been laid yet apart from the points leading into the middle. That was as far as I got then I moved from my flat last April to a bungalow which has needed some serious renovation and a fair amount of money to bring it up to scratch hence the reason for not being on this wonderful forum. I am now in a position to build a small train shed 10 feet X 8 feet (that is the maximum I can get without getting some serious hard landscaping done) That will give me some extra room for expansion to where the cassette fiddle yard was to be. I thought that having extra room would be great but now I’m going totally insane trying to work out what's best to do. Option one. Stick with my original plan. Option two. Dismantle what I have already built (Track, Wiring, Servo motors, And Quite a few hours programming Arduino) And start again from scratch. Option three. Use the extra room and make some sort of fiddle yard or even use it to extend the scenic part. Option four. 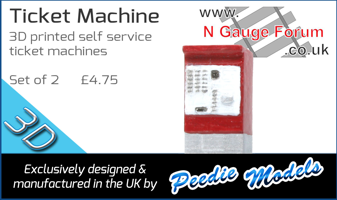 Bin the lot and start again in OO gauge or some other gauge. It’s option three I need some Ideas for. Here is a plan I made earlier just to get some idea of the extra room I will have. If I do keep the original part I will be extending the front by about four inches just to add extra scenery. Anyroad give me some ideas please. I can upload the Scarm files if anyone fancies a go at them. John, I'd be going for option 3, but dispensing with almost all the extra turnouts on the extension board. This section could be a rail line running through scenery with a spur to a small industry perhaps. But then, my preference in model railroading is trains running through scenery so I'm biased that way. Definitely not option 3. Wash your mouth out! I'm with Webbo. There is plenty of operating potential on the original board. Give yourself some pretty scenery in the extra section, sit back and enjoy the trains running through it. If you did want an industry, a siding or two to perhaps a dairy or distillery or something (depending on location) would be sufficient. I think George means "definitely not Option 4" and maybe the anaesthetic has reached his brain cell. I agree with the above. A simple track into some scenery - a slight incline, over a river bridge by the campsite ................ sorry, getting carried away with your space. After posting my questions I was thinking what if I just keep it simple and have just a single branch line coming from the far right siding which is already on the main base board and low and behold look at your replies . I could run this to a small single platform station long enough to take three coaches and a run around loop so that I could use steam as well as a DMU or autocoach. It seems like most of you would use the extra space for scenic purposes and as suggested I have enough to play with shunting etc on the main board to keep me happy. I have considered some sort of industry but I can’t think of anything without cramming too much onto the available space so I think I will probably keep it quite rural maybe incorporate some kind of water like a canal or small river as sugested. I’m still a novice at this and know very little about prototypical operations so any suggestions will be welcome. As for era and location I suppose that will be determined by the stock I already have which is mainly GWR locos and rolling stock. Class 20, 22, 35, 42, 52, Hall, Manors, 4500, 3800, 5700, and a few others not GWR. The locos highlighted will be staying but the others could be exchanged for something more appropriate if needed. I imagine that the 5700 and 4500 would be the best choice for the branch for now as I doubt any of the others would ever be seen on such a branch line. Anyway please keep the suggestions coming. Good job you said that when you did! The 'powers that be' were just about to have a meeting regarding your expulsion from the forum.